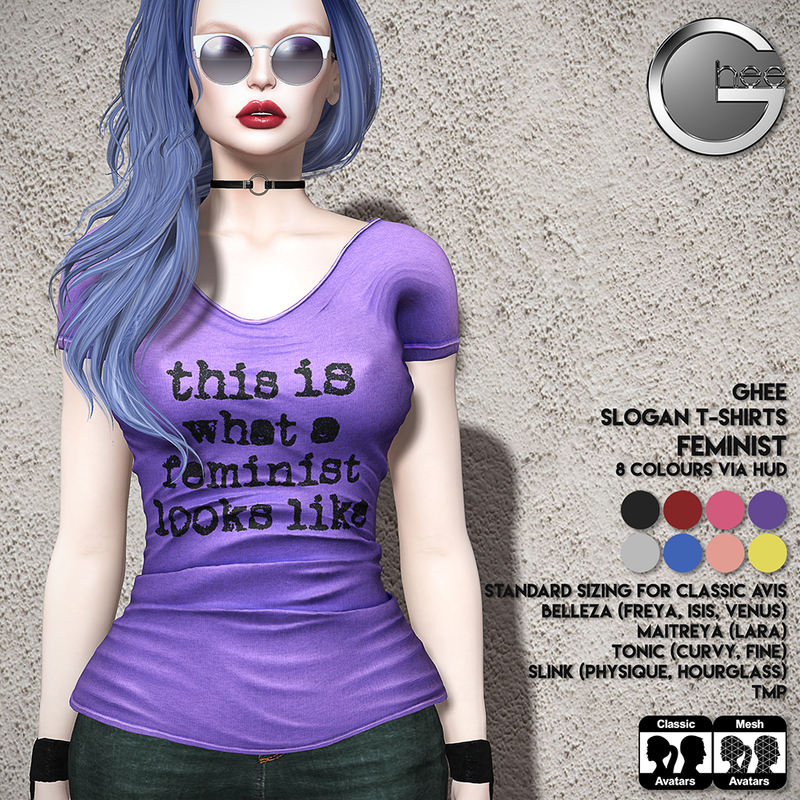 Ghee is getting hip at the Hipster Fair 2018 with some great new releases for your wardrobe. The pretty vintage style Thrift Shop Dress is an event exclusive special offer - half price (just 100L) ONLY at the Hipster Fair. And because we love our kids, there's a pretty dress from Baby Ghee in the same fabric too! (Maybe Mommy used the offcuts from her dress to make it?). No self respecting hipster chick would be seen without her shades, and we have some classy ones for you this time round. With a HUD giving you 8 color options for the frames, 5 metal options and 5 lenses options our Hipster/18 Shades will go with just about anything! The Hipster/18 Shades are unrigged mesh and come with a resizer. Materials enabled - switch on advanced lighting to see them shine! Slogan and printed T-shirts never go out of fashion, and Ghee brings three witty examples to add a touch of humour to your casual look. 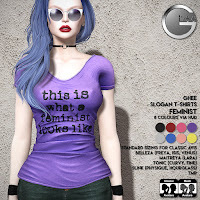 These short sleeved T-shirts come in a vast array of sizes - 5 standard sizes for classic avatars (alpha layer included) and fitted mesh for Belleza, Maitreya, Slink, Tonic and TMP mesh bodies. Each T-shirt design comes in 8 colours, HUD controlled, with shades drawn from the new Spring/Summer 2018 Pantone Fashion palette. Wear with jeans or shorts and make a fashion statement! 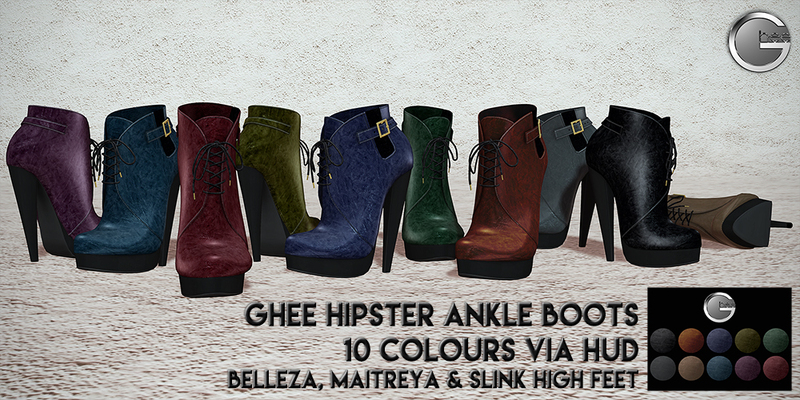 We also have some new stylish lace-up leather ankle boots for you! These are smart enough to wear with a dress or skirt, but also great worn with pants! Rigged mesh for Belleza, Maitreya and Slink high feet, our Hipster Ankle Boots come with a 10 colour texture HUD and are materials enabled. 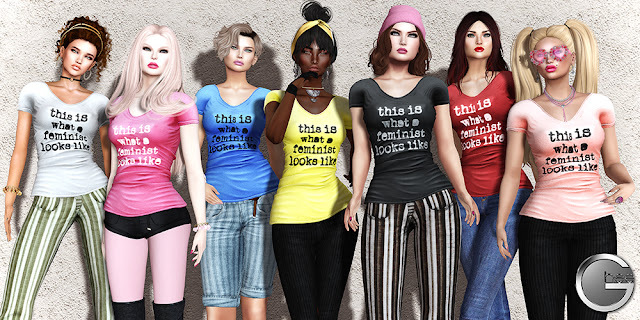 As well as the new releases, we've put a range of clothing and accessories out at our chic boutique at the Hipster Fair that will compliment the new stuff - we highly recommend a visit! Not only to see the merchandise and try some demos, but also to grab the little dollarbie you will find there! It's a set of 3 pairs of BIG hoop earrings (in gold, silver and rose gold) and on sale for just 1L! Grab a ride to The Hipster Fair and check it out! The Hipster Fair closes on Saturday 3rd March - so don't miss out!